Calling all foodies and Food Network fans! 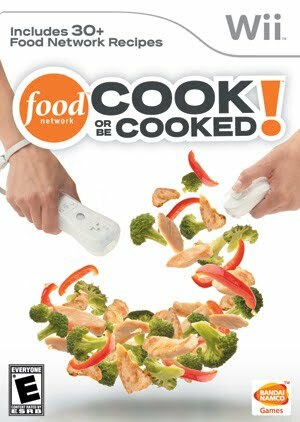 The Food Network and NAMCO BANDAI Games just released a brand new cooking game for the Wii – Food Network: Cook or Be Cooked. Remember, when I had attended the sneak peek event for the game with Michael Symon a few months ago (post)? Well, If you still haven’t heard about it, the game features Food Network personality Susie Fogelson, of The Next Food Network Star, and Food Network Kitchens chef Mory Thomas – and teaches you 30+ real Food Network recipes and the skills and culinary tricks you need to execute them with precision. Now what kind ofother games other that?? In honor of the game's release they are letting me offer my readers a culinary cornucopia prize pack. The pack includes a copy of the Wii game, plus tools of the trade and other fun Food Network and Cook or Be Cooked branded items. To enter, post a comment here for a chance to win. Be sure to reply with a valid email address in the body of your comment or link to a profile where I can find a way to contact you if you should win. Also, you'll receive an additional entry if you tweet this contest too. Ends Saturday November 28. Update: Congrats to Nathan! I have a hard time cooking and this would help a ton! Would totally love to win this prize pack so my wife and I can learn to cook better together and have fun! Thanks for the chance to win! My contact stuff is on my site, 3amjosh.com, or on Twitter @3amjosh. Please let me know if u need more info! Tara - you always have the best giveaways! :) So great! hi i love the food network. I'm sort of obsessed with the little cooking games on Facebook. I'd love to win this. Hey Tara, I'm a frugal foodie and would love to win your gift pack. The Food Network stuff looks way cool. Nice meeting you at Red Plum 2 nite. Ok...my husband LOVES the Food Network!! hehe!!! Now i've seen everything for my Wii. this is pretty sweet! It would be perfect to win this since I just ordered myself a Wii! What an awesome prize pack! I'm a HUGE Food Network fan! I would love to win this - I have a hard time finding games for the wii that I like sometimes, and since I am a Food Network addict this is right up my alley. Do you think I would be better at the game than real life? LOL!! I want to win! I love to cook! My family would LOVE to win this!! Thanks for the chance! Finally, a video game that I can play :). Well, seeing as I can't really cook that well in real life, this will be really helpful in preventing me from burning down the kitchen! Ooh I love it! I love the Food Network and look forward to playing the final verison of the game. Pick me. Wow! This is an amazing prize pack. I love our Wii, but knowing that it could help me cook... love it even more. Very cool, I bet my kids would love this as much as me! I love The Food Network something hard. Great contest. I've already told my husband this is what I want for Christmas. Don't know if he heard me or not. I watch Food Network every day - and I love to cook. I only wish I could cook on Food Network - lol. this looks amazing!! My husband and I are always watching the food network!! Wow, this sounds awesome!! I just bought my bf a wii for his bday and think this is probably the most perfect game ever! Will Tweet as well...thanks for the contest, Tara! What a fantastic prize pack. I love all things FOod Network so this is such a great prize to enter for. Thanks!! Its such an interesting concept! OMG - too funny - I just added that game to my wish list on Amazon less than 10 minutes ago... I wanted to get it for Derek for his B-Day!